Inspiration Archives | Levisay Consulting, Inc. Inspiration Archives | Levisay Consulting, Inc. It may seem an odd place to start, but this essay comes from an experience I had at a boy scout camp in Western Pennsylvania as a kid. The setting is the early 70’s, I was a young scout and my brother was five years older than me and an emerging Eagle Scout ( who also earned the “Order of the Arrow” which is quite a distinction) and my dad was the Scoutmaster of our troop in Murrysville Pennsylvania, my home town. Every summer the scouting calendar was very active with hikes, campouts, etc. but every year we went as a troop to a local boy scout camp, Camp Conestoga in Somerset County. This lesson on planning comes from an experience I had there on the archery range more than forty years ago!! Unlike my older brother who excelled in scouting, I was always a bit more of a plodder. While I worked on my merit badges, outdoor skills and the required knot tying and first aid activities, I was a more “middle of the pack” scout. One area where I did have some unique proficiency was on the archery range, which stemmed from my dad owning archery equipment and us all learning how to shoot as young kids. When I got to Camp Conestoga that summer and realized they had a serious archery range and a “end of camp” competition, I was all set! Early in the week I signed up for the camp wide archery competition and was excited for the event to start at the end of our time at the camp. While not a widely attended event, I was excited to see a good number of other scouts coming out to shoot and to watch the event and was exhilarated to learn that the winner of the event would win “The Camp Conestoga Golden Arrow Award”( note gold not silver) and the winner and his troop would be announced at the end of week all scout campfire!! Now that was big-time!!! The event was set for each shooter to have three arrows to shoot, and to shoot those arrows from three different distances, with the low scoring scouts dropping off as the distances increased. The first set-up was very easy, maybe 10 yards, and I had three great shots and advanced easily to the next distance. The second position was from 25 yards out and while harder, I knew that distance, adjusted my trajectory and made three good shots and made it to the final round…. the long distance shot! Now I would love to say that the third position was 100 yards or more and while it felt like a mile, it was probably in the 50-75 yard range. My first arrow flew and dug into the ground well short of the target, a total miss! My second shot hit the edge if the target, but just barely, and glanced off …. zero for two! My third shot actually hit the target but was in an outer ring, nowhere close to the bulls-eye! 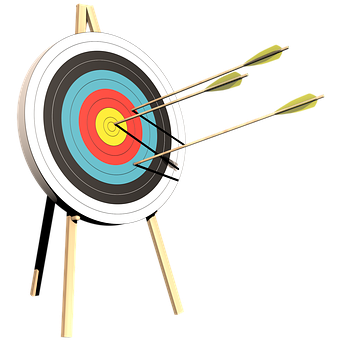 The two or three other scouts who made it to the third distance were also challenged, but one fellow got two of his three arrows to hit the target, and one stuck pretty close to the center…. I had come in second and was to receive the “silver arrow” (no plaque and no camp wide announcement) which was a pretty generic aluminum shafted arrow….pretty disappointing after all of my buildup!! While not a very high-water mark in my scouting career, that experience at Camp Conestoga taught me an invaluable business lesson that I have reflected on often. At the third and longest distance, In order to be successful in actually hitting the target, one needs to imagine the arrow’s flight in the air and actually aim for the curve of the flight, not the target itself, in order to be successful. I really needed to imagine a series of hoops in the sky that my arrow needed to fly through in order to be successful …. the exact same discipline needed to be proficient in business planning!! I am in the middle of a project currently where we are focused on hitting key five-year metrics, and instead on being myopic on those specific out-year results, I keep reminding myself to focus on the annual and quarterly metrics in years 1-3 (the hoops in the sky) knowing that the only way we can achieve those results in five years is to meet and exceed the closer-in targets/”hoops.” It may seem overly simple, but across my career I have been part of or consulted with too many groups that get inspired by but at times consumed in “destination planning”, myopic on the end results completely forgetting the “required flight” of the business required to accomplish that destination. My advice today is to stay focused on and active in the discipline and work of planning in your business. Take the time to look out to the horizon and imagine/dream about where you are trying to take the business/department/team that you are responsible for but always remember the “silver arrow.” Before you start shooting your “professional arrows,” refocus/re-aim on the “hoops in the sky” and insure your close-in action plans will guide your arrow to the farthest target!